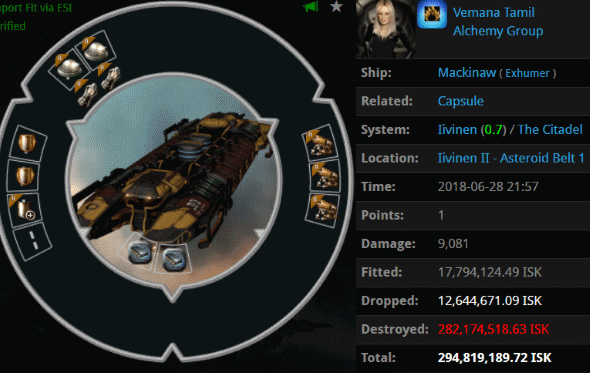 Previously, on MinerBumping... Anansi Veles and her alt lost Mackinaws in the same hour, in the same asteroid belt. Anansi attempted to position herself as the ultimate "Former Fan", claiming that she used to respect the New Order and its Code. There was no record of Anansi owning a permit. But there was more to this miner than met the eye: Anansi had a secret in her past. 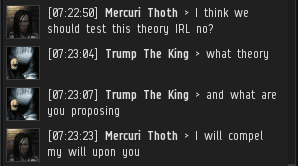 Agent Lewak invited the alleged former Code supporter to give him constructive criticism. However, Anansi fell silent. Something was going on at that very moment. Another Mackinaw loss! Anansi's other alt--also a member of Alchemy Group--was mining in the exact same asteroid belt as the other two had been. She never bothered to move. That was three Mackinaws she'd lost within an hour. What a Goofus. As you can see from the timestamps, Anansi remained silent for a long while. When she stirred, Anansi was no longer the same miner. She had undergone a transformation. It only took a few words. Lewak recognized Anansi in an instant. There had been no record of Anansi, but she'd encountered the New Oder before, on a different character. What we're about to see is a demonstration of our Agents' extraordinary mastery of highsec and all of its inhabitants. There are, one might suppose, a hundred thousand people living in highsec. Surely a rebellious carebear can hide among the masses, invisible to our Agents? No such luck. We monitor all Code violators, to a degree which they can scarcely imagine. Anansi's true identity was Mercuri Thoth, whose freighter loss and tears were documented in the "Carebear Tears Are Liquid at Room Temperature" series. That was all the way back in October 2017. One might be skeptical. Could Lewak really recognize someone so quickly, just from the use of that phrase about compelling one's will? 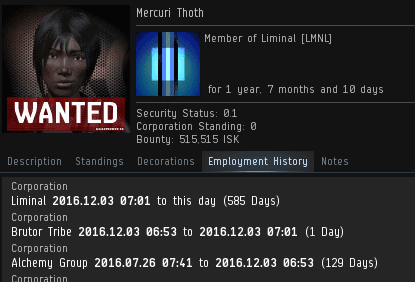 Well, back in a MinerBumping post from September 2016, Mercuri was named along with Anansi in an Agent's EVEmail. Back in 2016, Mercuri was a member of--you guessed it--Alchemy Group. Yes, Mercuri Thoth and Anansi Veles were one and the same. Anansi didn't bother trying to hide it any longer. It took three dead Mackinaws to reveal her final form, but from this point forward, she would tell the Agents what she really thought about the Code. It had been most of a year since Anansi's altercation with our Agents as Mercuri Thoth. The passage of time hadn't changed her one bit. She was still preoccupied with the same thoughts. One idea held a tight grip on what was left of Anansi's mind: Agents compel their will on others. She was tormented by the notion. Back in her Mercuri Thoth days, Anansi had ended up purchasing a mining permit. She'd spent some of her money, but she didn't change her heart. Could our Agents truly rescue the miner from herself--or would she resist the compelling truths of the Code? It's a stupid shitter that allows themselves to die to the same group over and over and over. EVE is obviously too complicated for the likes of anansi, maybe she should biomass and go back to wow. Maybe we should help her find the will to quit. 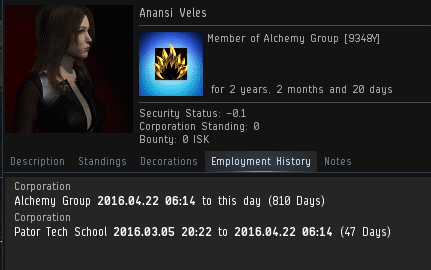 It did wonders for shardani when he quit EVE, not only for himself, but his family is better off too. Well, the rest of his family anyway. Software InstalltionIt was decent work. I extremely like your thoughts. And I acknowledged by your work. your article is exceptionally great and accommodating for us.